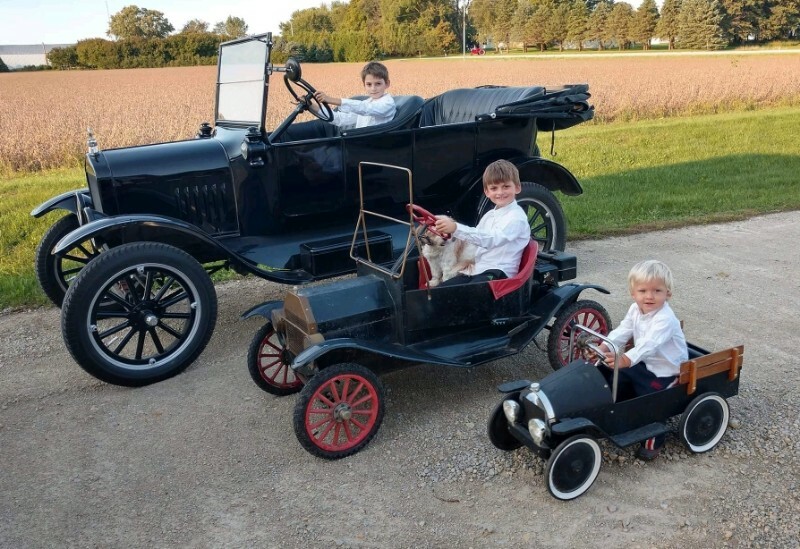 Model T Ford Forum: Darn kids with their jalopies! Darn kids with their jalopies! Model T Ford Forum: Forum 2018: Darn kids with their jalopies! That is one way to get em started. My cousins had the exact car in the middle. We called it the "put put car", it was awesome for a 6 year old kid. But my uncle had a 29 Stutz with a rumble seat. That's one of the neatest pictures I've seen in a long time! Thanks! That's one of those photos they should retake every 5 years. Love it. You will be giving them gas money, showing them how to fix things that break, and they will thank you the rest of their life�s. I do the same with my God Children. It works. And the dog 's name is........ Cool picture. I sure have some good lookin grand kids. Derek, now you need to post a video of all three driving around your acreage at the same time. Let's not let gramma see that or she might have a heart attack. That's an awesome photo Derek. Send that in to Langs for their calendar! Would love to find one like in the middle to restore. Like I said before, my cousins had one like the middle one. I sent her a picture of this and she's trying to see if it's still around. Our other cousin had it last and his kids wrecked it. If salvageable, I was volunteered to fix it...somehow ! Shriners or Kiwanas used to have them in parades, might check with the locals and see if any have one to sell, Sam.